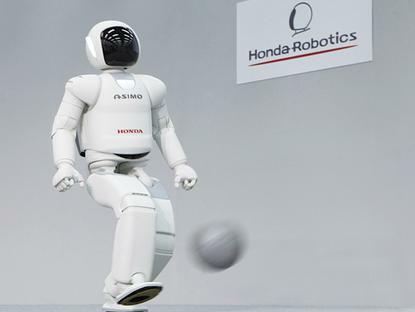 Honda Motor Co. has created a bilingual robot that can communicate in both English and Japanese sign language. The upgraded version of the Japanese company’s ASIMO (Advanced Step in Innovative Mobility) robot is built to duplicate the complexities of human emotion and genuinely help people. The new robot can also run faster than the previous model, climb stairs more efficiently, hop, jump, reach for and grasp objects, balance on one foot and transition seamlessly between walking and running, the company said. Honda Australia director Stephen Collins said the new capabilities demonstrate that the company is one step closer to providing mobility solutions for many different people. The company hopes that in the future, the robot could serve as a second set of eyes, ears, hand and legs for people in need. The robot is built from magnesium alloy, plastic resin and other materials, is 130cm tall, weighs 50 kilograms, and uses a rechargeable lithium battery. It can comprehend and respond to simple voice commands and can recognise the face of a select group of individuals, Honda said. Using its camera eyes, the robot can map its environment and register stationery objects and avoid moving obstacles as its navigates through its environment.